If you are a fan of the golden oldies from the 50’s & 60’s, you will love this genuinely authentic blast from the past. This Phoenix 50s 60s Band is a true throwback, fondly recalling the good old days. The days of Juke Boxes, 45 Records, Soda Shops and Sock Hops in the gym. That great era of Duck Tails, Pony Tails, Pig Tails, Crew Cuts and Flat Tops. An enjoyable trip down memory lane to the times of Fender Skirts, Tail Fins, Curb Feelers, Suicide Knobs, Baby Moon Hubcaps, Drive-In Movies and Back Seat Bingo with your favorite girl. Get nostalgic and leave your cares at home, cuz the memories of those good old days will fly unchecked as you relive a time when music refused to let you sit still. This is a Cookin’ vintage presentation, in tributes to Rock n Roll legends, like Elvis Presley, Bill Halley and his Comets, Chuck Berry, Jerry Lee Lewis, Buddy Holly, Richie Valens, The Big Bopper, Little Richard, The Coasters, Fats Domino, Sam the Sham, One Hit Wonders, Doo-Wop, Motown, The Twist, the Beatles and more. Music was never better and you can “Remember When” at this show. Most people know the words, everyone smiles, some laugh out loud and others even shed a few tears. That’s what this Phoenix 50s 60s Band is all about. Prepare yourself for a return to the days of Rolled Up T-Shirts, Peddle Pushers, Penny Loafers, Saddle Shoes and Blue Suede shoes. Some audience members even attend wearing the classic outfits and hair styles. Let your mind wander back to those special Rock n Roll Gold days. 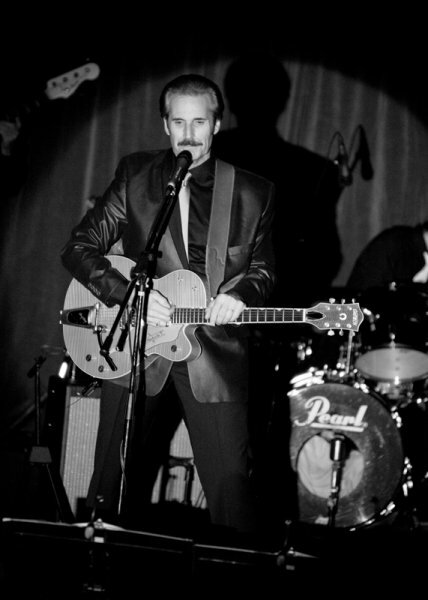 The leader of this Phoenix 50s 60s Band surrounds himself with some of the best musicians in the southwest in order to do justice to these great Golden Oldies. Anything else would be Rock ‘n Roll sacrilege. With an acting background in Hollywood movies & TV, and as a multi-award winning anchor, he brings seasoned presence to the performances of this Phoenix 50s 60s Band that will help you remember and re-live the great period in time that brought us the slang terms Cloud Nine - Cookin’ – Cool – Cooties - Deuce Coup – Hipsters - Party Poopers - Pop The Clutch - Rag Top - Stacked - and Think Fast. As a Screen Actors Guild member, his acting highlights can be viewed at the Internet Movie Database site. From ‘89 to ’91, he produced his own syndicated TV variety show, while also hosting radio shows in Phoenix and Las Vegas. In ‘93 he costarred in the premiere episode of the New Route 66 for NBC. ’94 found him starring as a body-snatching alien for New Line Cinema Productions in the motion picture sequel “Hidden II - The Spawning”. In ’95 he starred as Homicide Detective Sgt Gold in “Undercover” (with Meg Foster) for Axis Films International. And, in ’96 he starred in his favorite role as the new “Grizzly Adams” in “Treasure Of The Bear”, with Joseph Campanella. This show is reminiscent of American Bandstand and Alan Freed’s traveling Rock n’ Roll Caravan. It’s always fun to remember the best parts of days gone by. 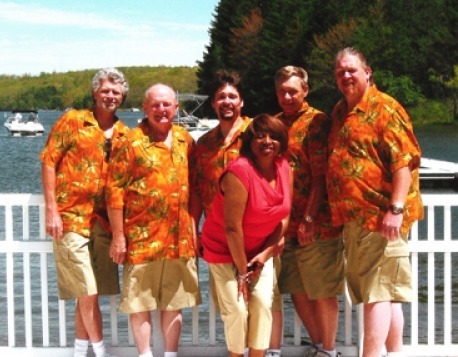 This Phoenix 50s 60s Band will be your tour guides on this trip down memory lane. Let’s Rock n Roll, Baby!